Home » Posts Tagged "Oscars Hair"
I first posted Charlize Theron in “Mad Max Fury Road” October 2013, then again when it was belatedly released on May 15, 2014. Here I am posting it again because the movie got so many Oscar nominations today. And can be seen on HBO tonight. Here is my post. 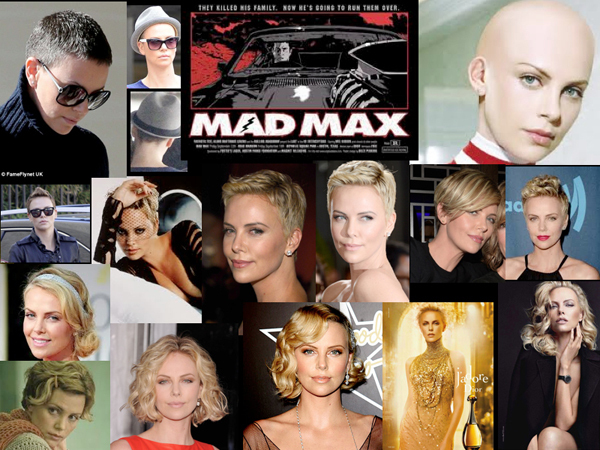 Movie Actress, Oscar-winner Charlize Theron and her hair over the years from long to mid to bald to short buzzed with (omg, top right) grey showing to a short crop growing out beautifully. No wigs for Charlize. Most of us first saw her cropped hair after the Mad Max shave at the 2013 Oscars, with Charlize looking magnificent, a hot standout, but here are some earlier photos. We also remember her from past Oscars, red carpets, the great J’Adore Dior Perfume Ads and we’ve always thought her beautiful, even bald. Photos from Getty, Daily Mail/FameFlynet.uk, glamour.com, instyle,com, justjared.com, laineygossip.com,hair4tomorrow.co, J’Adore Dior and we will add any credits missed.